On August 9, 1751, James Davis issued the North-Carolina Gazette, the first newspaper to appear in the colony. The newspaper wasn’t Davis’ first foray into publishing; he had established the colony’s first printing press two years earlier in New Bern. In that capacity he printed currency and various official publications. The newspaper, unlike modern print papers, did not have headlines or much local news. It focused mostly on international news and the arrivals and departures of ships. 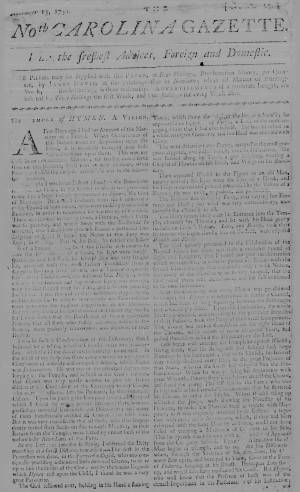 The Gazette was supposed to have been published weekly but, from the issues that survive, it appears to have had no regular schedule and wasn’t published at all between 1759 and 1768. A terrible storm destroyed Davis’s print shop in 1769, forcing him to salvage what equipment he could and rebuild his business. The Revolutionary War also presented Davis with problems in regularly issuing his Gazette, making it difficult for Davis to get paper and forcing his son, who was his assistant, to serve in the army. Davis served as the colony’s public printer until 1782 and he kept issuing the Gazette until just before his death in 1785. The paper appeared in another form between 1786 and 1798, when it was used by another printer to promote the Bill of Rights and other causes.